It doesn’t matter if you’re a professional sailor or a coastal cruiser, being in good physical condition should be a priority. Harry Legum, founder of Annapolis Sailing Fitness, talks with Quantum experts about the importance of sailing fitness and what you can do to improve your own sailing fitness. What does Sailing Fitness mean? Those who are active in the sport understand how the right exercise and the right food directly affect their quality of sailing, focus, recovery, and longevity. Casual cruisers appreciate how training improves their balance, agility and core strength. Whether you face the physical demands of racing or just need to be able to get on and off a boat, help out with docking, and do a few chores – your sailing fitness matters. Sailing Fitness takes you from where you are now to where you want to be. 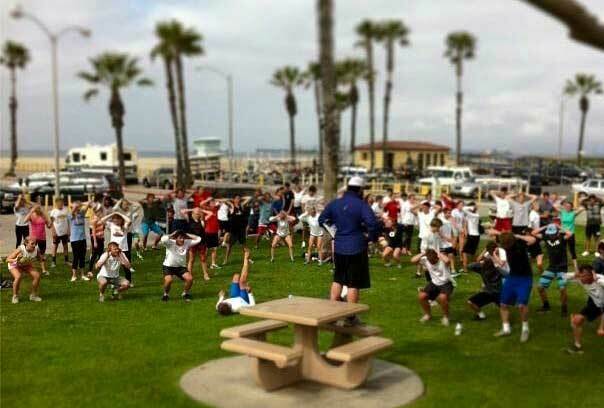 Why should you worry about sailing fitness? Even if you never step foot on a boat again, Sailing Fitness helps you sail through life’s challenges. We just happen to be sailors. With the right moves and the right nutrition, you can enjoy a better life, lower your stress, sleep better, increase your energy, lower your blood pressure, and achieve greater balance and agility. When you’re fit, you’re nicer to people and take pride in yourself. Whether you’re a professional sailor, Olympian, junior or senior athlete, high school or college sailor, yacht club, crew/team or casual cruiser, we customize Sailing Fitness to meet your needs. We start with the total person and where you are now. Then we combine variety, safety and form to create the perfect program for you. So how do we get started with improving our performance on a sailboat? Please consult a physician before starting any new exercise program. Let’s first take stock as to where we are and where we want to go. This will involve honestly evaluating our current physical condition and overall health. The types of goals that can be set vary so much that we will not have the time to cover them all. However, we can try to determine the type of sailing that we are doing, such as casual cruiser or competitive racer, and go from there. One of my focuses as a Trainer is to incorporate exercises that require nothing more than effort. Gym memberships, wellness groups, a personal trainer and such – as great as they are and hold tremendous value – are not required to do the work. For advanced intermediate athletes, this can easily be incorporated into any routine resulting in tremendous results. 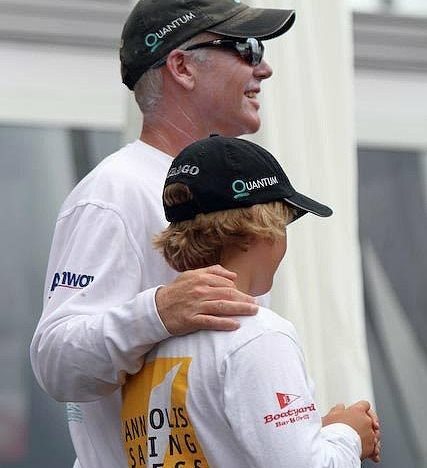 A Family Affair - Quantum's Terry Hutchinson and his son Elias. Again, this begins with where you are now. We need to prioritize by adding exercise to our daily planner and commit. For some, simply going for a walk or equivalent is what’s needed. If a person has not moved much for “a season or two”, getting the blood circulating for a solid 20 minutes is the priority. We are trying to create new habits with relatable, simple, no excuse movements that we all know to be healthy. Depending on health and considering how you may want to sail (i.e. working bow, mainsail, on the rail, etc.) will determine what additional training is needed with upper and lower body, cardio, balance and core. Exercises such as crunches, pushups, planks, lunges, squats (no weight, in place) are all on the table as long as no adverse physical conditions rule these out. The amount of reps vary yet I’m always swayed towards higher reps, lower weight and perfect form. Advanced racers can incorporate supersets. 1 minute side Plank with dumbbell, immediately to 1 minute of Burpees, immediately to 1 minute of Pushups times 3 sets. No rest. See how that works for you in between a normal weightlifting regime. It will shock the system, force overload and demand greater performance which, after practicing these and a multitude of other combinations for a good 2-3 weeks, directly improve performance regardless of position. For a video clip of Quantum Sails Director of Offshore One Design, Scott Nixon, demonstrating ways to work on strength, core, balance and agility – all in one sitting – click here. Knowledge without direct action only leads to despair. Proper nutrition is such a key to performance that we would be remiss not to address in our initial tips. It helps with energy, recovery, injury avoidance and repair, attitude and decision-making. We can discuss nutrition in volumes. Many of us already have the answers. I would highly recommend two books: Chris Carmichael’s Food for Fitness as well and Laird Hamilton's book Force of Nature for an overall view on nutrition, training, and lifestyle. I have found that after 30 years of being a professional trainer, clients who have the greatest and longest lasting results all have the strongest “Why?” Eat like you’re “In training”.